How long will the stitches have to stay in place after surgery on rhizarthrosis? Does one get a cast with this surgery? How frequent does one have to change the dressing (cast) after surgery? Is the administration of drugs as part of the postoperative care after surgery on rhizarthrosis appropriate? Is it normal to experience a loss of sensitivity in the area of the scar located on the thumb? When can one expect to be able to fully use a hand that underwent surgery on carpometacarpal osteoarthritis? Does postoperative care require physiotherapeutic treatment or exercises? What is of great importance to a patient engaging in physiotherapy due to surgery on rhizarthrosis (carpometacarpal osteoarthritis)? What else should one consider during postoperative care after surgery on rhizarthrosis? What are the results one may expect after surgery on carpometacarpal osteoarthritis (rhizarthrosis)? Provided the wound heals properly, stitch removal may take place ten to fourteen days after surgery. The removal of sutures from the thumb saddle joint is usually not painful. When applying the technique as shown in the image the only thing a patient will feel is the lifting of the suture with the tweezers. It is not a mandatory requirement. However in order to allow for proper healing of the wound inside and outside it is recommendable. Furthermore the cast will help alleviate the pain during the first weeks after surgery. The plaster splint used to immobilize the thumb saddle joint seen in the image very clearly shows how the other fingers and the thumb interphalangeal joint retain their mobility. Immobilization of the thumb saddle joint after surgical removal of the trapezium bone. 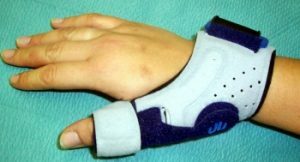 An option to obtain immobilization after stitch removal could be the application of a thumb splint (as seen in the image). As long as the wound is healing properly I usually change the dressing two to three times during the first weeks in order to inspect the wound. If the healing process is exceptionally good, one to two changes of dressing per week will suffice. In case of swellings and pain in addition to the cast immobilization it may be appropriate to administer anti-rheumatics such as Diclofenac….or similar working agents. ]These drugs do not only alleviate the pain they also have an anti-inflammatory, de-swelling effect thus enhance the healing process. I always recommend never to take any medications without first consulting with your family physician as these drugs also come with a variety of side-effects. (for example risk to develop a gastric ulcer). Many patients report a strange skin sensation in the area of the surgery scar. Oftentimes the sensation on the extensor side of the thumb is being perceived as being altered. Patients refer to it as a numb or tingling sensation. These symptoms are caused due to an irritation of the cutaneous nerves running within the operating surface. The compromised sensation will disappear as soon as the scar matures which can take anywhere between weeks and months. If a larger cutaneous nerve is not just pinched but cut (please refer to potential risks during surgery on carpometacarpal osteoarthritis) the “numb sensation” will remain and in addition an electrifying pain (neuroma) in the area of the injured nerve will develop. A hand that underwent surgery should be gradually and slowly reintroduced to everyday exertions. One should allow several weeks or even months before returning to full usage of the hand. If you act to daring, the hand as well as the wrist will most likely hurt and swell up. The operating surgeon will be able to determine as of when the hand may be put to use without restrictions. Please note: An unlimited “green light” for particularly straining sport activities such as tennis or golf can only be granted nine to twelve months after surgery. I strongly encourage you to consult your treating physician before engaging in these activities. There is no one-fits-all approach to this question as every individual is different. Many patients who underwent surgery start putting their hand to use with excellent results shortly after the stitches were removed. For these individuals their personal daily agenda constitutes the best “physiotherapeutic exercise”. I recommend to practice this personal physiotherapy in lukewarm water ( 5 times 5 minutes daily) for about six weeks. It is also good advice to frequently apply a greasy ointment to the surgery scar during the first months. Patients, who however, do not reacquire mobility capabilities corresponding to at least average levels, should be encouraged to engage in early physiotherapy. It is of great importance that the performed exercises never lead to pain in the hand or even swelling of the hand! A too intense exercise program is actually damaging to the healing process and rather leads to greater mobility dysfunctions as opposed to improve the process! Should you run into a therapist who is not willing to address your individual needs it is best to change the therapist! Surgery on carpometacarpal osteoarthritis requires a great deal of patience on the part of the patient as well as of the treating therapist. Please be aware that scars on hands tend to remain sensitive for a greater period of time and that the final result of the procedure on rhizarthrosis can only be evaluated after approximately nine months. If an artificial joint had been used to replace the damaged thumb saddle joint the final result will be reached in a shorter span of time. Whether surgery is successful does not depend on the duration of the symptoms that lead to the procedure. In my experience which is based on performing surgery on carpometacarpal osteoarthritis on over one thousand patients more than ninety % of the patients were very satisfied with the results of the surgery nine to twelve months thereafter.